Wall paintings inside 53 Chipping Hill, restored. 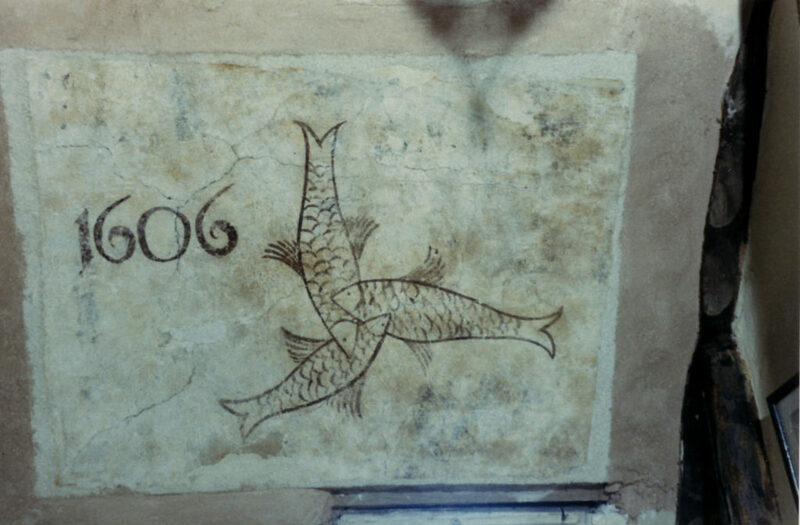 Three fishes (representing the Trinity) and the date 1606, over a stairway. In that year number 53 was owned by Christopher Greene or his daughter Sarah. Christopher died sometime between 1593 and 1608 so it is possible the date commemorates his death. Photos of other paintings in the house are numbers M2 to M5. Muriel Carrick, who restored the paintings, wrote that “Usually of course three joined fishes represent the Trinity, but then they are in a circle but this might be an exception I suppose, They are each overlaying, a sort of giving and receiving. They are over a stairway”. Joe Waters told me that representing God pictorially was blasphemy, hence the common use of symbols like three interlaced fishes.